Tracking Mike Adams, the "Health Ranger"
Add 10 YEARS to your LIFE on New Year’s Eve — QUIT SMOKING! Begin by asking yourself, “why can’t I quit.” Go ahead, say it out loud once. I’ll wait … “Why can’t I quit” … Okay. Good! Now, YOU ARE NOT going to like the answer, but you ARE going to love the solution. That’s the difference between this method of cessation and all the others, you face yourself and you face reality. I did the research for you, so when you quit this time, you will know why you couldn’t quit last time you tried, or thought about trying, and that’s all the difference in the world. See, when someone chooses not to do something, if they DON’T know the reasoning behind their choice, then the next time it rears up, they most likely will not make an educated decision, and that’s how people repeat the same behaviors and mistakes, over and over, and over again. QUIT SMOKING AND USE YOUR BRAIN! Vaping 95% SAFER than Cigarettes! Vaping 95% SAFER than Cigarettes – Add in 4-Hour Krave Kicker and QUIT Cigs for GOOD! Little do most Americans know that vaping is 95% safer than smoking cigarettes. Why? You eliminate ammonia, bleach, pesticides, formaldehyde, and insecticide. End of story. Only one problem left to solve. Your nicotine addiction. However, there’s much LESS nic in vaping. Cigarettes contain near 100 mg nicotine per cigarette, where nic juice for vape is between 5mg and 15mg. So HOW do you ween yourself off nicotine? The best new invention of 2018! 4-Hour Krave Kicker! All natural liquid supplement eliminates cravings for nicotine. Non-addictive, safe, PROVEN! A “6 pack” of 4-Hour Krave Kicker saves you from cigarettes, headaches, wasted money, and even helps you enjoy your days and all those “non-smoking” events! How would you like 6 four-hour blocks where you didn’t crave cigarettes at all? One of the biggest nightmares of being a smoker is needing a smoke badly when you’re somewhere that you can’t get to one. That nervous, anxious feeling creeps in and you can’t do anything about it. Or can you? Now, there’s 4-Hour Krave Kicker! Never before has there been a product on the market that keeps smokers from craving cigarettes. Some people are turning to vaping, and that’s MUCH BETTER than smoking cancer sticks, but most vape still contains nicotine and a few artificial ingredients, like the flavoring and coloring, sometimes. Do you want the good news or the good news? That’s what we thought. 4-Hour Krave Kicker contains no artificial ingredients, no nicotine, no sugar, no caffeine, no GMOs. It’s an all-natural proprietary blend of supplement remedies mixed just for people experiencing the cigarette hangover! Only $2.99. Could save your life, prevent cancer, diabetes, Alzheimer’s, and more! Great shopping guide too. Highly recommend. Start Your Own Natural News Blog! 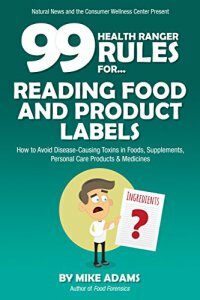 Don't Eat Cancer – the Book!